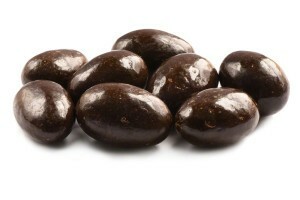 Dark chocolate covered peanuts are an elevated version of one of the most popular snacks consumed by people of all ages. Peanuts have been enjoyed for years at ballgames, on road trips and as a favorite anytime snack. Dark chocolate is revered for its health benefits. When it is pour over peanuts the result is an irresistibly delicious, healthy snack. Dark Chocolate (Sugar, Chocolate Liquor, Cocoa Butter, Anhydrous Milk Fat, Soy Lecithin (An Emulsifier) and Vanilla) Peanuts, Gum Arabic, Corn Syrup, Sugar, and Certified Confectioners Glaze. Can never go wrong with dark chocolate, wish I bought more. Have them hid from the kids! I bought these for my husband. We switched to eating more dark chocolate for health benefits. I can’t stop eating them. Another order – and continued delight! I think I would also like to enjoy these as clumps of peanuts with your dark chocolate poured over same. Dark Chocolate and Peanuts! High on my list! And these hit the top. Thanks so much. I love anything dark chocolate!! These are the BEST!! !